Elbtreppen is a recently accomplished riverbank project by Zaha Hadid Architects that spans along the Niederhafen Port at River Elbe, the river that divides Hamburg into roughly two equal regions, located between Landungsbrücken and Speicherstadt (Baumwall), two of the oldest urban spots and tourist magnets of this port city. “The Niederhafen was once a significant commercial port in Hamburg from the 17th to the 20th century. The name Niederhafen (“low harbour“) arose from the position of this port area beneath the timber raft barrier (“Niederbaum“ or low raft) between Baumwall and Kehrwiederspitze, which served to safeguard the entrance to the port.” (Der Landesbetrieb Straßen, Brücken und Gewässer, Hamburg). 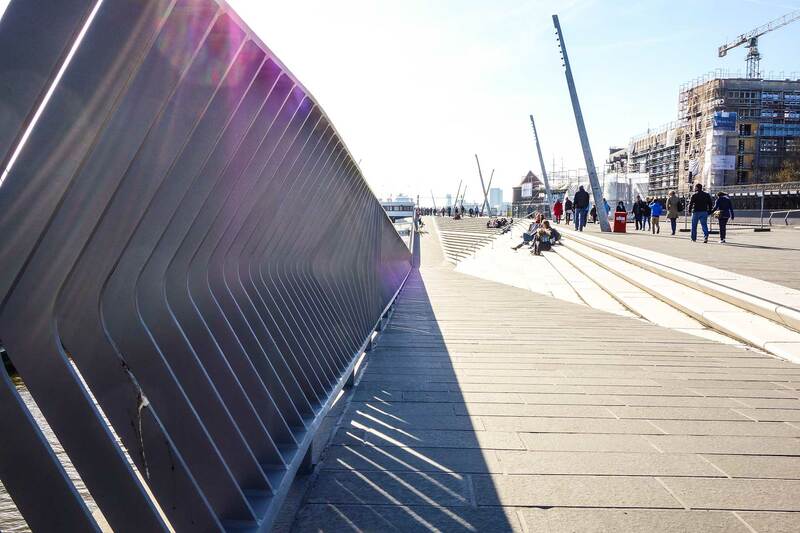 As the existing promenade’s structure at was already outdated and not giving an aesthetic value to the city, the riverbank is reshaped to form 750-meter long promenade with large sweeping steps where people can sit and hang around enjoying the magnificent wide view of River Elbe. Just newly done in the first quarter of 2015, this river space design project has indeed proved that flood defense construction can be combined nicely with attractive urban design to form a multifunctional urban element that is able to provide higher resilience of the built environment against water-related climate change effects, as well as giving enjoyable waterscape to the inhabitants.